Let's get the ugly stuff out of the way first. I am a Jets fan. That makes me both very biased and not very bright. Now that that's settled, I would like to take umbrage with this, because it has been lodged in my craw all afternoon. Please note that this is not part of the the very excellent NFL Roundtable 2012 because, well, no one asked me to do it for the NFL Roundtable, this is all sua sponte. The reaction to the New York Jets dismantling of the Buffalo Bills was nothing if not predictable. Various prognosticators had the Buffalo Bills, who just one year ago were 4-12, finishing the 2012 season anywhere from 8-8 to 10-6. Don Banks said they were "closer to dethroning" the Patriots than the Jets were. Virtually everyone had the Bills finishing in second place in the AFC East, behind the Patriots. Oh, that defense! The New York Jets, particularly the offense, were a league-wide joke coming out of preseason. Now, most of those linked articles are nothing more than worthless opinions. We all understand that, but they are "Bold Predictions" and presumably bold enough to stand the test of one terrible, terrible opening week. As it turned out, the Jets offense was surgical and the defense stout when Sanchez and Co. were less than sharp. Alas, the Jets only beat the Bills yesterday and it turned everyone into the anti-Dennis Green. And this all went down quietly, out of the spotlight at 1:00 p.m. Speaking of which, the New England Patriots also played at 1:00 p.m. on Sunday. As did the New Orleans Saints. And the Detroit Lions. And the Houston Texans. 18 of the 32 NFL teams played at 1:00 p.m., a day when CBS did not air a late-afternoon game because of the U.S. Open. So, The Jets-Bills game was buried along with most of the NFL. 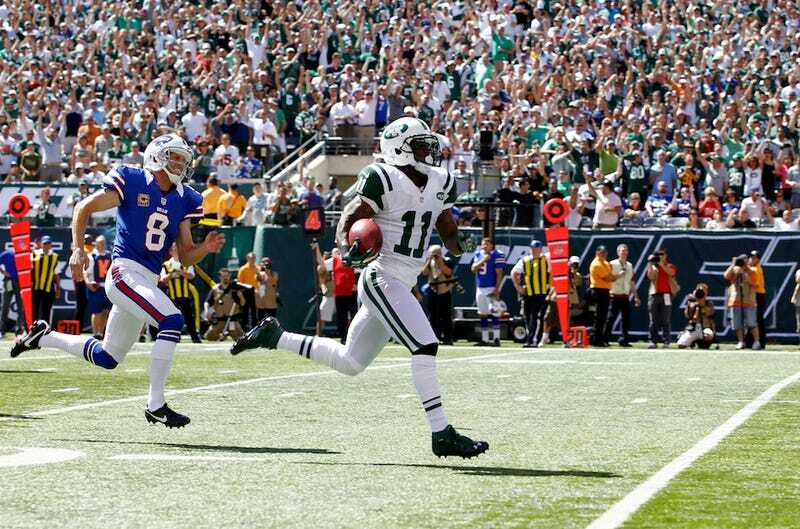 Last year, the Jets were 2-6 in non-1:00 p.m. Sunday games. They lost a west coast game to the Raiders. They were destroyed by the Ravens and Patriots (your 2011 AFC Championship game, by the way) in successive weeks and lost to the Patriots again on a Sunday night. The Eagles murdered the Jets on a late afternoon in December. And, yes, that goddamned Thursday night game against the Broncos. Of those teams, only the Raiders and Eagles were not playoff teams. And the Eagles, despite their disastrous start, still had a (slim) chance at the end of the year. The discounted-because-they-lacked-expectations playoff runs in 2009 and 2010 were still played despite no one apparently expecting anything from a playoff team. Mark Sanchez won road game after nationally televised road game even though it wasn't in the script. And then the wheels fell off the wagon last year. There are many potential explanations for the disaster that was 2011. Injuries, schedule difficulty, the flukiness inherent in a football game where a second off in timing changes everything, compounded by the importance of each game in a 16-game schedule. Or it could be the crushing weight of expectations. Maybe all this excuse-making and discrediting offends me as a Jets fan; it probably does. Or maybe I'm overly sensitive as a fan of a little-brother franchise; I probably am. But it also offends me as a watcher of football. There is no reason to short change a decisive football game because the narrative was flipped and the team everyone thought was supposed to be good was blown away. In fact, just get rid of the narratives altogether. We need them about as much as we need an ethereal explanation for the not-quite-inexplicable reason the New York Jets lost to better football teams at 4:00 p.m. one season ago. It's the same reason the Bills lost at 1:00 p.m. on Sunday.